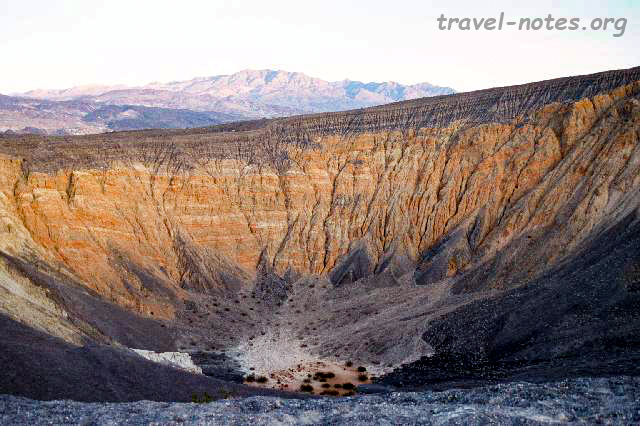 Death Valley National Park is located at 4.5 hours north east of Los Angeles. This national park, the largest in the contiguous 48 states, is easily the driest and the most desolate. As far as altitude is concerned, no other park can boast of such extremes as found here. 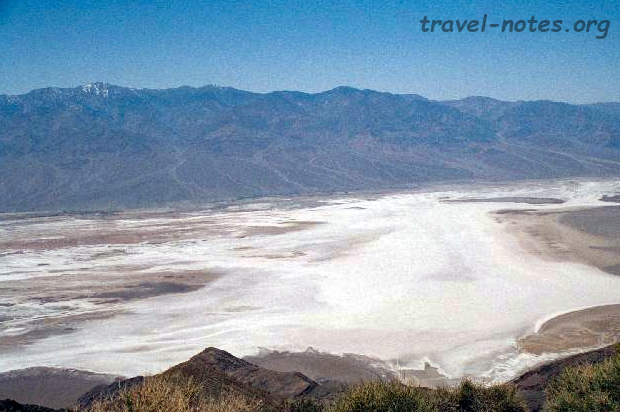 Within a few miles from Badwater, the lowest point in the continent (-85 m), rises the towering Telescope Peak, the highest point in the park (3367 m). A trip to this park is incomplete until you hike up this peak. Visitors not having more than a day to spare should definitely stop by the Dante's View Point (1800 m) from where one can get a stunning view of the entire valley including the lowest and the highest points in the park. 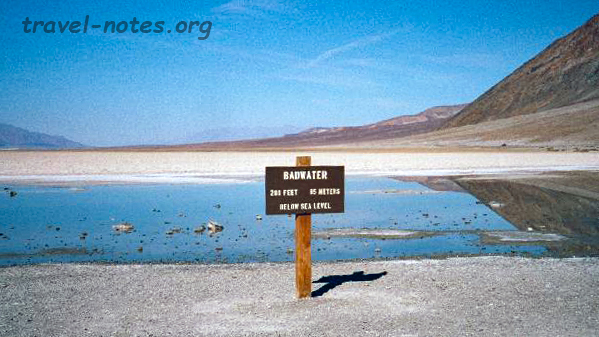 A trip down to the lowest point would tell you why this place is so devoid of vegetation. Firstly, the place receives less than 5 cm of rainfall every year, and on top of that the water found around here is salty. In the dry season, which is pretty much during most part of the year, one can see miles and miles of salt deposit in the valley. One such area filled with the rock salt pinnacles is the Devil's Golf Course - looks more like a dried up swamp than a Pebble Beach. Zabriskie Point, named after the Borax vice-president, is one of the best vistas in the park. Colourful folded hills greets the visitors at this point. A few miles to the west lies the artist's drive which takes one through the most colourful region of the park. It goes over the alluvial fans and passes through canyons offering some unique views of multi-coloured hills in the background, pick of which is present at the Artist's Palette view point. Sand dunes, which is hardly a surprising landscape in such an arid environment, covers about 5% of the park. The dunes in the foreground, pink hills in the mid ground and the grey mountains in the background presents a very unique landscape to the viewer. Found close to the dunes are clumps of arrow weed shrubs in a place called Devil's Cornfield - yes, the devil owns cornfield apart from a golf course around this area! Scotty's Castle, dedicated to Death Valley Scotty - the regions most famous prospector, is situated on the eastern rim of the valley. A 4000 year old crater, created by water gushing out of the earth, is situated a few miles from the castle. The Ubehebe and the little Hebe craters adds to already varied landscapes of the region. If you have the time and the service of a 4 wheel drive, consider visiting one of the most intriguing places of the region - the Racetrack. 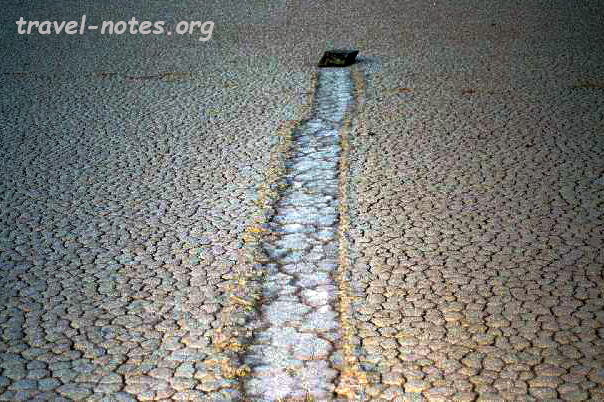 Large boulders have mysteriously travelled across the dried lake bed leaving the "racetracks" behind them. Although none have seen them move an inch, scientists attribute the phenomenon to gusty winds. One important advice I would like to pass on after my experience in the valley is to always fill your petrol tank to the maximum whenever possible. There are only about 3-4 stations in the park and the surrounding areas and if we hadn't made it to one of them at a place called Dyer, we would have given a new reason for the name of the park. If you have time, do visit this park - one of the very few winter friendly parks of the country. Click here for more photos from Death Valley.